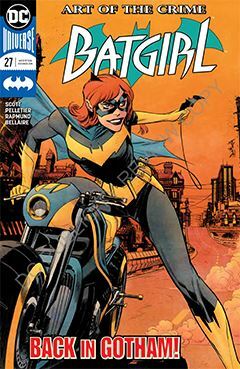 Batgirl is on the trail of Gortesque, but with her spinal implant compromised, she’s not at her physical best to confront the serial killer. This leads to concessions in her battle against crime: moving in with Dad and letting him take care of her (sort of), and a return to one of her old costumes, which may not have all the gadgets and gizmos she’s used to. But it soon becomes apparent there is more to the Grotesque case than meets the eye. She might have realized it sooner were it not for her injuries from her previous battle, but as things become clearer, they also get more complicated. Her spells continue; blackouts resulting in fugue state in which it’s hard to discern reality from hallucination. I’m still loving the artwork of Paul Pelletier and Norm Rapmund. I hope they stay on Batgirl for a good long time. They’re a team DC should keep together, regardless of what title they’re assigned to. They share a universal style that would be suitable for just about any title, but Batgirl is a good fit for the time being. It’s a typical super-hero murder case, but what makes it a-typical is that the story wouldn’t work for just anyone. There's an emotional component that would not work on just anyone; not Batman, not Nightwing, not Green Arrow. Writer Mairghread Scott makes it entirely Batgirl’s own. I think that demonstrates not only the strength of the story, but also the strength of the character within it.